The massive breed of domestic goose known as the Toulouse was developed in France in the Haute Garonne region as early as the 1400's. A principal city in that region is the ancient town of Toulouse which gave the breed its'name. Frequently used to obtain the enlarged livers used for the signature French dish pate de foie gras, most Toulouse at the time probably did not weigh close to twenty pounds and certainly did not resemble the massive, deep keeled birds of today. Toulouse were exported to England during the 1850's and it was there that today's version of the breed began to take shape. English breeders selected birds with massive, deep bodies and heads that featured broad skulls and pendulous dewlaps. By the turn of the century, Toulouse weighing between 30 and 40 lbs. were being exhibited in England. A number of importations of Toulouse to the U.S. were made in the period between 1850 and the mid 1900s. Some came from England and some were imported from Germany. Today's Toulouse is a true fancier's breed. By that I mean that some prized characteristics are possessed by the breed that are not of any economic significance, namely the keel and dewlap. I would characterize the breed as fast growing but slow maturing. If that statement seems to be contradictory, let me explain. A Toulouse gosling grows very quickly. By several months of age, it may well weigh over 15 lbs. and be almost to adult proportions at least in terms of length and height. It will take that same bird two or more years, however, to achieve the massiveness of body size and head proportions that it will need to compare well to other adult Toulouse of good quality. Frequently, as a matter of fact, winning Toulouse at major shows in the U.S. are four to seven years old. In its' first year of life, a Toulouse will grow it's basic frame. It may well take another two or three years or even more to fully fill out that frame. The original and by far the most common color pattern in the Toulouse is the Gray which is really a gray and white pattern of color. During the 1970's a Buff (actually, buff and white) color made it's appearance and was added to the Standard. Today, Buff Toulouse may not make up more than 5-10% of the breed and good specimens are often quite difficult to obtain. 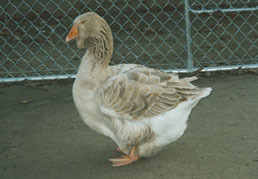 The Buff Toulouse shares the same Standard color description with the American Buff Goose. That fact has led a number of breeders to use crosses with the American Buff as a shortcut to producing more Buff Toulouse. First, second, and even third generation crosses between the breeds usually yield "Buff Toulouse" that are much more refined and smaller in size than authentic Buff Toulouse should be so let the buyer beware when purchases are made from breeders one does not know. Buff Toulouse are much rarer than the grays but the best of them are of excellent quality. 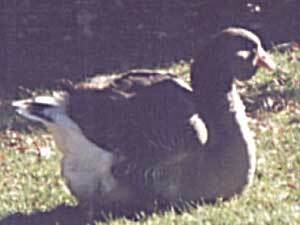 This gander was repeatedly chosen not only Best Toulouse but Champion Goose. Because the buff color gene is recessive, a cross between a Buff and a Gray will yield only Gray offspring. One of those birds (often called splits) mated to a Buff should yield some Buffs as well as some Grays. I should mention that there is also a pure white version of the Toulouse being shown occasionally but the few I have seen have so far to go in terms of Toulouse type to be competitive that at best it must be considered a work in progress at this time. Once suitable breeding stock of either color has been obtained, the birds must accept one another as mates and the birds must be managed well to maximize their productivity. The heavy breeds of geese sometimes do not readily accept mates selected for them if they have been left in a large flock situation where they might well have selected other mates. The best way to proceed is for the mating to be placed together in the early fall ideally in a location which is isolated from the main flock. Normally, young birds can be manipulated this way more easily than older birds from established matings. The mating once put together should be watched to ensure that the birds are compatible. This is particularly important where established matings are broken up or where, for example, an additional female is being added to a pair mating. It is commonly accepted by Toulouse breeders that matings of young birds may not be very productive during their first breeding season. The theory goes that in slow maturing breeds such as Toulouse, the males in particular may not be ready to breed in their first season. That may well be true, especially among the Buffs but I have had notable success in breeding from young Grays. 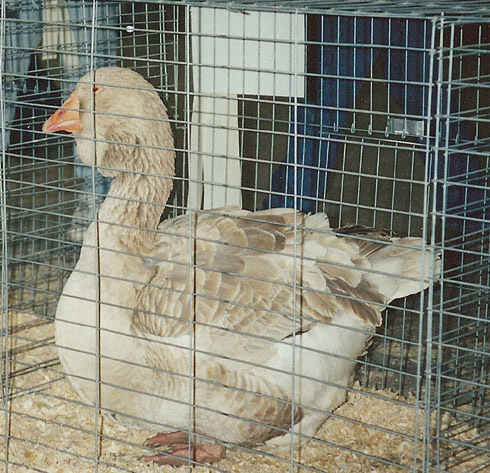 Because of their massive size, it is unrealistic to expect a gander to service more than two females and many experienced breeders prefer to breed Toulouse only in pairs. Due to the premium placed upon the development of massive keels, the most well developed males may prove to be poor breeding birds. Vigorous ganders that are large but somewhat more upright in carriage are often the most reliable breeders in terms of fertility. This young Toulouse gander was five months old at the time this picture was taken. His massive size and great keel development may make him a better show bird than a breeder. Weight management is also important if one hopes to have success on a consistent basis with Toulouse. Show weight with fully developed keels in both sexes is usually too heavy for birds entering the breeding season. The males will be too awkward to breed consistently and the females may well be at greater risk of "blowing out" their egg production organs when they enter the breeding season in an over-fat condition. Ideally, one will not show important breeding birds at all thus avoiding the need to force sizable weight fluctuations. This 2001 hatch Buff Toulouse female was the best female of either color ever raised at Acorn Hollow. During and for a few weeks before the breeding season, matings of Toulouse should be penned separately to avoid ganders fighting with one another over females and nesting sites. They should be fed breeder rations (not lay mashes) to insure that their eggs will possess the necessary nutritional requirements to hatch well. Fertility is likely to be better if some swimming water is provided. The water need not be more than 18-24 inches deep and molded plastic pools often serve well. During all times of the year when possible, Toulouse and all other breeds of geese benefit greatly from access to quality pasture. Certainly growing young birds thrive more when put on pasture with supplemental feeding of quality Grower pellets. The sight of a high quality flock of Toulouse is wonderful to behold. They are truly the royalty of domestic waterfowl. This flock of Buff and Gray Toulouse at Acorn Hollow contains birds from one to three years of age.